ME: I see that we have the love of fantasy in common! Your bio states that you grew up reading Tolkien, as did many of us, and I definitely see his influence in The Invisible Library, in the characters Silver and Kai. Your love for Sherlock Holmes was also referenced in this book. Did any other influences from your childhood reading surprise you while writing this book? GC: I’m not sure it’s exactly childhood reading, but I grew up watching Doctor Who. I didn’t realize quite how strong an influence it was on the books until my editor pointed it out to me! Another influence on the books was early reading in Michael Moorcock, and the conflict in his books between law and chaos, where humanity is placed somewhere between the two. And there’s the Journey to the West, which I read in an abridged translation quite young, and which I’ve loved throughout my life. ME: Looking at your background, and degrees in Statistics and Medical Application specifically, it seems a big contrast to writing fantasy and/or steam punk fantasy. Your descriptions of the mechanical creatures, dirigibles, etc. were so detailed, did you ever get caught up in the practicalities or impracticalities of what your imagination was creating? GC: I’m not sure if practicality/impracticality is quite the right word for what I’m thinking of, but I did try to bear in mind whether things were plausible in terms of the story. I was prepared to handwave quite a lot of mechanical implausibility (such as how you’d get a giant mechanical centipede to work, or whether you could rapid-brake a zeppelin by doubling its weight) as long as it felt right for the world in question. I’m afraid this isn’t the sort of novel which has a full scientific explanation justifying the creation of zeppelins, so I apologise to anyone who was expecting that. ME: When I read a series, with a female lead character, I enjoy reading about how their character grows and changes. Irene seems to be very practical in nature, not allowing emotions to overcome her mission. However, we see her struggle more with her emotions as the story progresses. Would you please give us insight into what we will see in future from Irene? How her character will continue to develop? GC: I don’t want to veer too far into “female character was previously obsessed by her work, but comes to realize that she can have friends too”. But it is true that Irene has previously avoided considering the future, and has been occupying herself with day-to-day assignments. I think part of her development will be the realization that everyone has to pay attention to what’s going on around them, and take responsibility for their action or inaction. ME: I am a big fan of the romance genre, and it seems that Irene could have a couple men vying for her attention in future books. Regardless of her future responsibilities, will you allow Irene to relax into a romantic role? If so, can you give a hint as to who her leading man may be? ME: I don’t want to give away the ending to The Invisible Library, because it sets the stage for future novels. Will Irene and Kai explore other alternate universes in future? My imagination was running wild with the infinite possibilities. If you could have them explore any alternate universe, what would be some characterizations of that universe? What kind of book would they search for? GC: I can definitely confirm that they will be visiting other alternate worlds. In book two, The Masked City, you get to see a couple of them. As for what type of world… well, it could be almost anything, but it will generally have something in common with Earth as we know it. The Librarians always collect fiction, but it might be anything – sagas, fairy tales, myths, novels, manga… Irene would claim that she just wants to go somewhere nice and peaceful for a change, where she can get hold of the latest target novel without any death-defying chases or dangerous schemes, but I think that she’d be bored within a few months. ME: Genevieve, thanks for giving me a little insight into how you created this world and the characters that inhabit it. 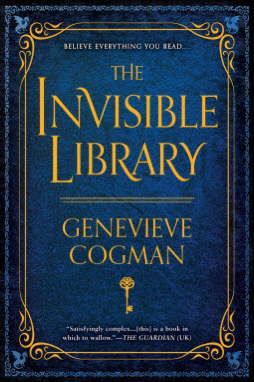 I really enjoyed The Invisible Library. The world you created was so descriptive and real, that it really made Irene and Kai pop against that imagery. Can you tell your readers when to expect the second book in the US? GC: Thank you for taking an interest, and I’m very glad that you enjoyed The Invisible Library. The second book, The Masked City, is due out in September 2016, and I hope that you’ll like it too.